Nestled within the heart of Tel Aviv, the city that never sleeps, is the beautiful Neve Tzedek, a community of artistry and architectural celebration. Just walking the streets of Neve Tzdek is an adventure worth taking, as the senses delight in the sights, sounds, and scents of a community that pulses with artistic energy. Neve Tzedek offers an eclectic variety of shopping and culinary surprises that will turn your sightseeing tour into a satisfying adventure. 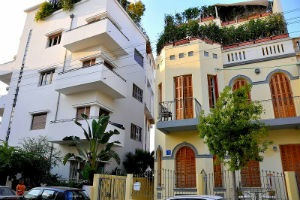 Effortlessly blending the best of the ancient with the progressiveness of the modern is a special gift of Neve Tzedek! 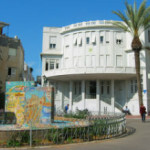 Neve Tzedek has an intriguing and inspiring history, and that history is visible today as one walks through the streets. Built in 1887, as part of the ‘new’ Tel Aviv, Neve Tzedek was left to decline, with buildings and antique roadways simply crumbling away, until the 1980’s when renewed investment of spirit and effort helped to transform the village and restore its former grandeur. Today, some of the original buildings, expertly restored, provide a focal point for local celebrations and tourism. You can stand on the rooftop of the Chlouche House, the first house built in Tel Aviv, and enjoy the ocean breeze. Explore the outdoor gardens on the patios of the gracious theater, the Suzanne Dellal Center. Neve Tzedek offers an architectural display that is not to be missed! The blend of older architecture and newer building design is astonishingly successful and very beautiful. The decorative style of the outer buildings is also a sight to behold, as though the buildings are a canvas touched lovingly by the colorful palette and fine hand of a skilled artist. And, indeed, this is true- although there were many hands involved in transforming Neve Tzedek into the beautiful village it is today. Opportunities for shopping seem endless, even in such a relatively small area- such is the magic of Neve Tzedek. 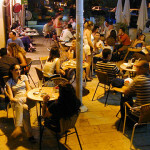 Don’t miss the shops and restaurants on Shabazi Street for a complete Neve Tzedek day tour.